Imagine green rolling hills that stretch to the feet of massive, boulder-like mountains. In the valleys, tranquil, finger-like lakes extend for miles, their forested shores occasionally interrupted by quaint settlements, grassy meadows and striking patches of daffodils. Crystal-clear streams and waterfalls abound. In the fields, white-faced Herdwick sheep graze peacefully, seemingly smiling at everyone who passes by, whilst in the towns, visitors are welcomed by a friendly hello and a tip of the hat. 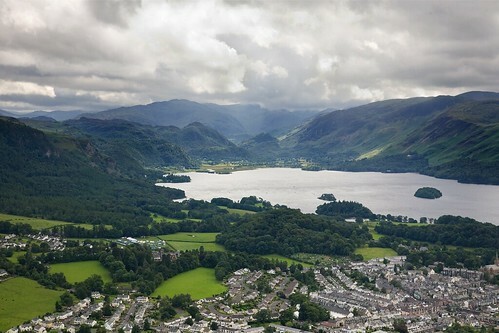 This is the Lake District in the heart of Cumbria. Some time ago, Zoë Dawes, better known as Quirky Traveller (and a featured VB Super Blogger), wrote a guest post in which she beautifully described her favourite 'Velvet Escape' in this beautiful region: a bench on the shores of Rydal Water. This bench, now christened the 'Velvet Escape seat', has since appeared in numerous media. On my recent trip to Manchester, Zoë, kindly offered to take me and my good friend and fellow Super Blogger Simon on a tour of the Lakes. Simon and I hopped onto a train for the 1.5 hour journey to Oxenholme (near the gateway to the Lake District), where we met Zoë. Zoë took us on a drive past the touristy towns of Bowness (with its plethora of shops, cafés and restaurants) and Windermere, where we made a quick stop at the lakeshore. We were immediately greeted by a bevy of cheeky swans. The sun shone brightly and everything seemed to gleam. Needless to say, the views across the lake were absolutely gorgeous. We continued our tour along Windermere, passing the most beautiful trees, fields brimming with cheery daffodils and lovely Victorian cottages. Zoë slowed down each time we approached a clearing in the trees, providing us with splendid panoramas of the lakes and the hills. One thing that grabbed my attention was the ample use of slate in the buildings, bridges and fences. We made a brief stop at arguably one of the most famous slate buildings in Cumbria, the Bridge House in Ambleside (incidentally, an absolutely charming town). Our next stop was Rydal Mount where the famous poet William Wordsworth lived until his death in 1850. Wordsworth's most famous poem, about 'dancing daffodils', was inspired by the landscapes of the Lake District. Rydal Mount is a gorgeous house, surrounded by stunning gardens, that's lovingly maintained by the curators, Peter and Marianne. A tour of the house and the gardens provides unique insights into the life of the Wordsworth family. We were really lucky to see Dora's Field (a patch of land adjacent to the estate which was bought by the poet as a gift to his daughter Dora) in full bloom - William Wordsworth and his wife Mary planted the field with daffodils in memory of Dora who died in 1847. The next stop on our tour was my personal highlight - a visit to the Velvet Escape bench overlooking Rydal Water. The bench can be accessed by crossing a stone bridge (opposite the entrance to Rydal Mount) and taking a right turn after the bridge. We parked the car and walked the rest of the way along a path that led us uphill. What awaited us on the other side of the hill was... the bench... and a simply mesmerising view of Rydal Water. We continued our drive along Rydal Water to the village of Grasmere, where we strolled around the lovely shops (my favourite was the little Herdy store with its cute, Herdwick sheep inspired souvenirs), checked out Grasmere's famous gingerbread shop and visited St. Oswold's Church and the adjacent Wordsworth graves. Grasmere is also home to another Wordsworth attraction: Dove Cottage where the poet lived during his early years in the Lake District. Our tour ended with a lovely drive back to our address for the night in Ambleside: the beautiful Waterhead Hotel. That evening, Simon and I sat down to a lovely dinner at The Bay restaurant in the hotel. As the sun set, casting a glorious glow across the lake and the hills, we tucked into a superb meal comprising chicken liver parfait and lamb cutlets, and accompanied by a divine Pinotage. A fitting end to a truly unforgettable day. It's a pub quiz favourite. The answer is quite surprising: ONE. The Lake District, in the northwest corner of England, may be famed the world over for its stunning lakes, gorgeous scenery and impressive mountains, but technically, this answer is correct. There's only one lake: Bassenthwaite Lake. There are many other bodies of water but these are called "meres" or "waters", such as Windermere, Grasmere or Rydal Water. This post originally appeared on the Velvet Escape travel blog.